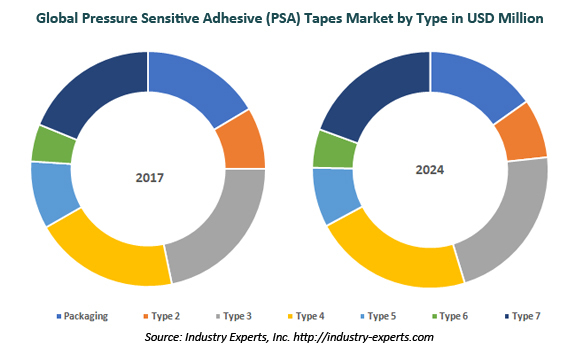 Industry Experts, Inc. published the global market report on Pressure sensitive adhesive (PSA) tapes. As per the new report entitled “Pressure Sensitive Adhesive (PSA) Tapes – A Global Market Overview”, Polypropylene dominates as a backing material of PSA tapes accounted for about 60% of global market in terms of volumes in 2017. Pressure sensitive adhesive (PSA) tapes, also known as self-adhesive tapes, will adhere to most of the substrates with pressure and do not require any solvent, water or heat to activate the adhesive. Pressure Sensitive Adhesive Tapes are widely used in many different applications in automotive, electrical & electronics, medical, packaging and other industrial sectors. Pressure-sensitive tapes with advanced acrylic adhesive technologies have become the bonding solution of choice in a vast number of applications covering diverse industries and have replaced liquid and spray adhesives, mechanical fasteners and other bonding and fastening systems. Industry Experts, Inc’s analysts estimated that the Packaging tapes accounted the lion’s share of global PSA Tapes market with about 65% in terms of volume in square meters, in 2017, while Medical & Hygiene tapes ranks top in terms of value with $10 billion in the same year. Asia-Pacific is projected to grow faster than any other region, both in terms of volume consumption and market value through to 2024. PSA tapes analyzed in the study include packaging tapes, masking tapes, electrical & electronic tapes, double coated tapes, medical & hygiene tapes, adhesive transfer tapes and other PSA tapes comprising cloth tapes, protective film & other film tapes, foil tapes, transparent tapes and foam tapes. The report explores PSA tapes market with respect to backing materials segmented into polypropylene, paper, polyvinyl chloride and others including film, foil, glass fabrics, non-wovens and foam. The study also analyses the PSA tapes market by adhesive technology – solvent based, water based, hot melts and radiation (UV/EB) cured. The report reviews, analyses and projects the Pressure Sensitive Adhesive (PSA) Tapes market for global and the regional markets including the North America, Europe, Asia-Pacific, South America and Rest of World for the period 2014-2024 in terms of volume (square meters) as well as value (USD). These regional markets further analyzed for 20 independent countries across North America – the United States, Canada and Mexico; Europe – Germany, France, Italy, Poland, Russia, Spain and the United Kingdom; Asia-Pacific – China, India, Indonesia, Japan, South Korea and Taiwan; South America – Brazil and Argentina; Rest of World – South Africa and Turkey. This 530 page global market report includes 445 charts (includes a data table and graphical representation for each table), supported with meaningful and easy to understand graphical presentation, of market numbers. The report profiles 21 key global players and 88 major players across North America – 37; Europe – 25; Asia-Pacific – 22; South America – 2; and Rest of World – 2. The research also provides the listing of the companies engaged in research and development, manufacturing, converting and distribution of PSA Tapes. The global list of companies covers the address, contact numbers and the website addresses of 324 companies.